I apologize for the delay in this post but I've been very busy at work and at home right now. I'll do my best to push the third post as fast as I can. OK, next in line: The Timeline! The Timeline, or TimeSlider, is the numbered bar at the bottom of the screen in 3dsMax and Maya. Lucky us, they both place in the same place! They both behave the same way, but your workflow can change drastically from one to the other. I learned 3D in 3dsMax and when I switched to Maya, it was one of the hardest things to get use to. It was not because scrolling the timeline was different or anything like that, it was because handling the keys in the timeline is way different. You'll what I'm talking about... On to the review! The way you scroll the timeline does not change between both programs. You still have to grab the timeline cursor and drag it through the timeline to watch your animation. It's the cursor itself that changes. The way I see it, in 3dsMax the cursor is divided in two: The cursor itself and the Cursor Bar (or more appropriately called "Timeline Bar"). Maya has a more simple approach, in the sense that there is no bar, you can drag the cursor itself in order to go through the timeline. As I said, the principle is the same: Click and drag to move through the timeline. However, the means of doing it is different. In 3dsMax, in order to move the cursor you have to drag the bar instead. The cool thing about the bar though is that it doesn't change it's size no matter the range of the timeline, whether in Maya, the cursor will reduce its size in order to fit the range, which becomes a bit of a pain when working with big ranges (animations of 400+ frames). Another thing is that the bar displays your position and the number of frames you have in the timeline, while in Maya you have a value beside the timeline which displays your current frame, but you don't have the number of frames of the timeline. So Maya might have a simpler way to manage the timeline, but I believe 3dsMax is more friendly and easier to work with. Both programs use the same hotkeys to navigate through the timeline: "," to step backwards and "." to move forward. The default setting in both programs in different though. In Maya, you jump through keys while in 3dsMax by default you jump through frames. The difference is basically the way you switch between jumping through frames or jumping through keys. In Maya, to switch between these modes, you just have to add the ALT key to the hotkeys, so if you want to jump to the next frame, just press "Alt + .". 3dsMax has a special key to switch between the two modes, its called "KeyMode Toggle". It's located under the playback controls (see image). What this button does is enables the "," and "." to jump through keys instead of frames. So this is the equivalent of using the Alt key in Maya. In this feature there is no clear winner but I do prefer the 3dsMax way. Personal opinion. This feature is another one where both programs differ a lot. In 3ds Max, every key in the timeline has different colors: Red (position), Green (rotation), Blue (scale), Black (for modifiers), etc. By filtering the type of key, you can work with one transform type at a time, without the need of the Dope Sheet or the Curve Editor. Maya is different. The keys displayed in the timeline are called "Ticks" and they're only one color: Red. There is not much to say about it other than you can change the width of the ticks in the settings, in case you find them too thin. The tick represents a key in that frame, all translations and/or attributes. Now, there is a small difference in the displaying of the keys that not everyone will notice: The position of the keys in the timeline. 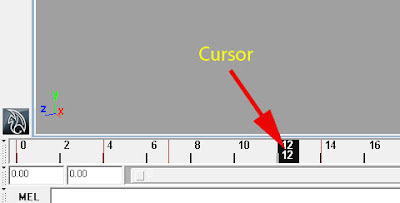 In 3ds Max, when you place the timeline cursor over a frame, the cursor covers the entire key. In Maya however, you can see that the key tick is located beside the cursor. This might be a bit confusing when first switching from one program to the other, but no worries, they both work the same way. Note: It's worth to mention that in 3ds Max, there is a way to display the timeline in a Frame:Ticks way. You just have to configure the display options in the Time Configuration window. You can also do it in the Time Configuration window and enter the exact values you want. In Maya it's a bit easier. You have input boxes where you can type the values you want for the start and end of either the timeline or the playback range. You also have a bar between these boxes that work just for playback, so you can easily adjust the playback range. The way you copy, delete or move keys within the timeline greatly affects your workflow, and as everything else in the timeline, there are some differences on how these two programs handle this feature. In Maya, there are two ways to copy one key to another frame. You can move the cursor over the frame you want to copy, RIGHT-click and select "Copy"; then move to the frame you want to paste the key and RIGHT-click to select "Paste". The other way is to put the timeline cursor on the frame you want to copy, then hover your mouse pointer over the frame in the timeline where you want to paste the key and MIDDLE-click. You'll notice that the timeline cursor moved but the animation stayed still. You can now add a key by pressing "s" (default hotkey) to add a key and keep that pose. In 3ds Max, there are also two ways to copy a key: The first method is to simply select the key you want to copy (in the timeline) and SHIFT-Drag the key to the frame you want that key. The second method is to move the timeline cursor to the key you want to copy, then RIGHT-Click drag the timeline bar to the frame you want to copy the key to. Once you release the mouse button, a pop-up window will appear asking you which translate you want to key. Press OK and you're done. As you can see, all methods are slightly similar, which make it easy to confuse with one another when switching programs. The same thing happens for moving keys. In 3ds Max, just select the key and move it wherever you want. In Maya, to select a key you first have to SHIFT-Left Click on the key to selected. The key will turn red. Then, you can move it. To delete a key in 3ds Max, select the key and press the Delete key in your keyboard. In Maya, put the timeline cursor over the key you want to delete, RIGHT-Click to open the menu and select Delete. - In Maya, changes in the timeline are undoable. In other words, whenever you scrub the timeline using hotkeys or by using the timeline cursor, you can undo the action. I have a post that explains a way to avoid adding those actions into the undo queue. - In 3ds Max, adding a key in the middle of your timeline (let's say frame 35) will automatically add a key in frame 0. You can stop this behavior by turning off that feature in the Preferences\Animation menu, under the "Auto key On" option. So, I have to say every time I work in Maya there are moments that miss the 3ds Max timeslider. I believe it's easier to work with, and the fact that you can filter what translation keys to show, plus the simplicity to copy, move or delete keys, places it on top of Maya's timeline. Do you know a way to change your maya timeline to be more like max? This is my only blocker left. I want to be able to select and move keys around, with Max's style of click and drag. Rather than Shift select then drag. Even to delete keys is mocu more easier in Max, click select press delete key. Rather than right click key, in dropdown menu select delete. Unfortunately, no. There is no way to change Maya timeline into 3dsmax (believe me, I've tried!). This is one thing that you HAVE to get use to. You can always use the Dope Sheet though. I guess the closest would be to right-click on the timeline bar and drag the bar to where you want the new key, then click OK on the window that appears. This method works when you do not have any key in the control (contrary to the first method explained above), however you have to have a controller selected to make it work - a difference with Maya, since the middle-mouse drag works even if there is no controller is selected. By the way, you don't have to drag the middle-button in Maya, you can just click the middle-button where you want the new key.